A few years ago however, I made this for our bed room. Trust me. Easiest thing I ever did. 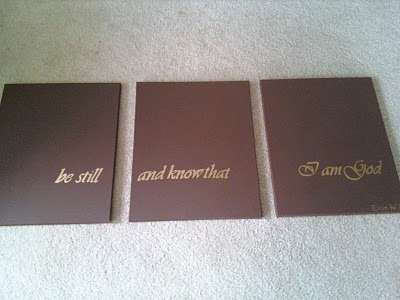 So when I see this pin on Pinterest, I figure it has to be easy, if not easier than the three I did before. I mean, it's paint tape and paint. THAT IS ALL. How simple is that? So I go buy the stuff (I hate Hobby Lobby, and craft stores in general) and get out. 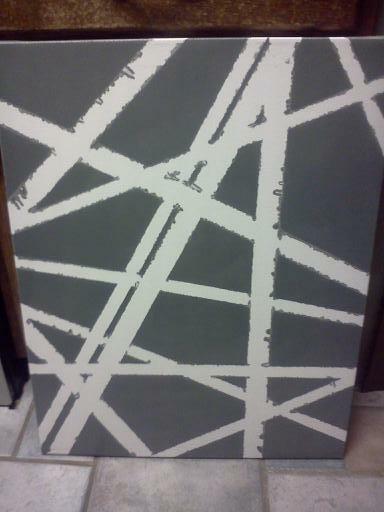 I come home, put the tape on the canvas and paint. I absolutely cannot stand to wait for paint to dry, so I made myself leave the house so I didn't mess it up. And then I peeled it off and got this crap. There is paint bleed all over the stupid thing. ALL OVER. 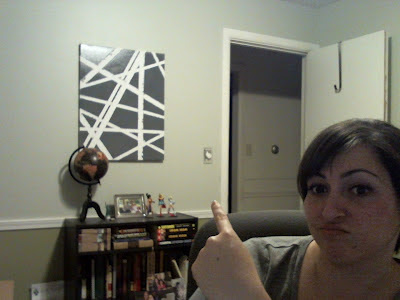 So, as any craft failure with self respect would do, I hung the stupid thing up. Because, I mean, I put all that work into it, I can't just throw it away. So I need your help. How do I remove that paint bleed? The white stripes are plain canvas. Help!